Angling Road bridge. Note the “mudbars” in the river. In writing the final chapter on the forks of the Mohican River, I wish I could say I saved the best for last. But I can’t. Muddy Fork is all the name implies and less. After all, you need water to make mud. At nearly 30 miles long, Muddy Fork doesn’t qualify for the “runt of the litter.” Jerome Fork and Lake Fork, which are connected to it, are half that length. However, Muddy Fork remains a shallow and narrow creek for better than half its length. Situated in a relatively flat part of Ashland and Wayne counties, its elevation drops only 270 feet, about nine feet a mile, so there is very little current. Dredged and straightened in the early Twentieth Century, it runs along a relatively straight path strewn with segments of the old channel, some of which hold water much of the year. For that reason, it could just as easily have been called Mosquito Fork. However, the characteristics that make it a hostile environment for humans have created a haven for wildlife. That aspect reaches its climax when Muddy Fork passes through Funk Bottoms Wildlife Area, a Mecca for bird and wildlife enthusiasts. At Funk Bottoms, it joins Jerome Fork just north of Ohio 95 to form Lake Fork of the Mohican River. Muddy Fork originates near the Five Points intersection. Muddy Fork originates as an intermittent stream just south of what is locally known as Five Points — the intersection of County Road 500 and State Routes 58 and 89. From there, it flows, for want of a better word, east to where it and a few unnamed intermittent streams are impounded by the Cinnamon Lake Dam. Cinnamon Lake was created in the late ’60s or early ’70s to provide drinking water and recreation for a gated residential community. Two years ago, problems with the aging water system forced the closure of the purification plant. Residents now rely on the Rural Lorain Water Authority for their drinking water. Muddy Fork is little more than a narrow, water-filled ditch when it leaves Cinnamon Lake. From there, it continues southeast past the western edge of West Salem, then turns south. The upper section of Muddy Fork gradually becomes wider but seldom has enough water to float a canoe — much less turn one around. Muddy Fork weaves in and out of Wayne and Ashland counties as it makes its way to Funk Bottoms. It also weaves in and out of itself in a sense. At some points, Muddy Fork intersects with segments of its original winding channel, some of which remained after it was dredged and straightened. 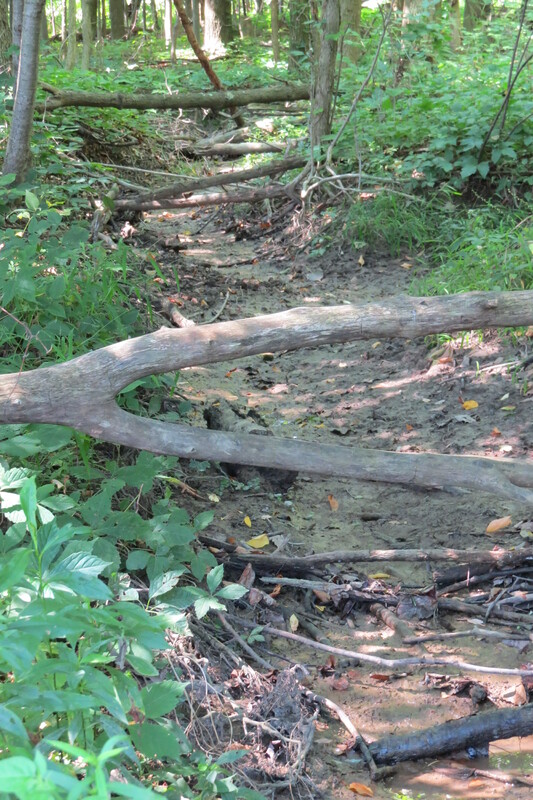 Some of the segments flow through and rejoin Muddy Fork during periods of high water. Others are dead end channels. In the last week of August, I paddled and slogged my way through more than five miles of Muddy Fork. I put in at the County Road 30A bridge and took out at Ohio 95, just past the confluence of Muddy and Jerome forks. At 5.5 miles, it was the shortest of three options. 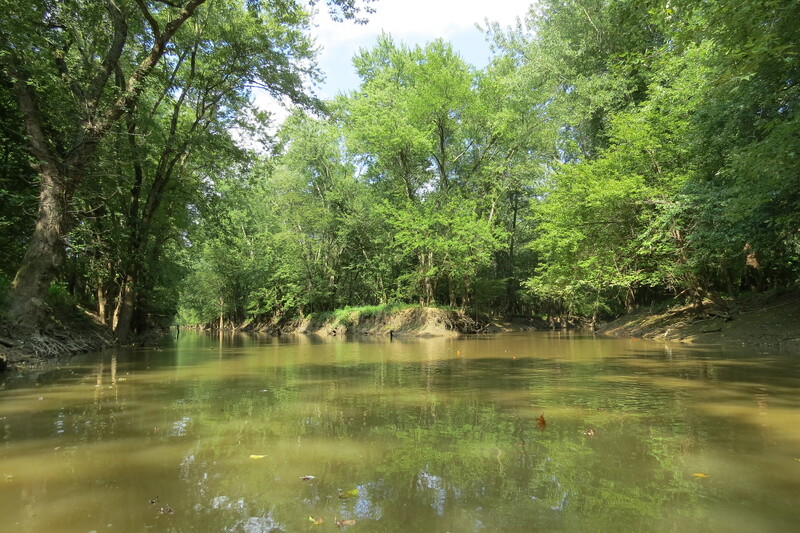 I had scouted the Muddy Fork corridor by car the previous week and concluded that, at normal levels, the river was deep enough and wide enough to paddle from U.S. 250, a trip of a little more than 10 miles. The other option was to put in at Township Road 1550, about two miles downstream of U.S. 250. Confluence of Jerome Fork, left, and Muddy Fork — forming Lake Fork. The County Road 30A option turned out to be the right choice. It took me nearly four hours to paddle, wade and portage. I put in at around noon. Had I taken one of the longer options, it probably would have put me at Funk Bottoms around sunset or dusk — the time of day when mosquitoes are at their worst. The down side of taking the short trip is I missed a section of the river that has returned to its natural meander. This pattern continues for a few miles past County Road 30A. 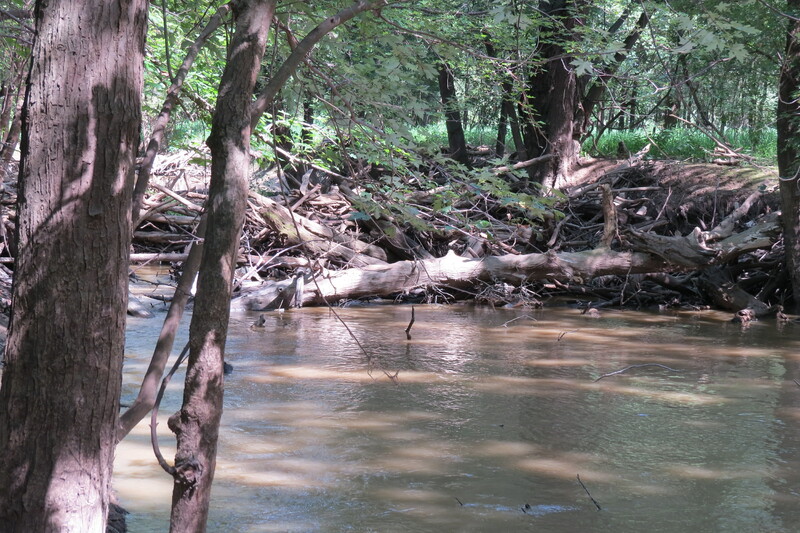 However, less than a mile upstream of U.S. 30, Muddy Fork’s channel straightens and remains that way for the most part. From County Road 30A to Angling Road, there is scant tree cover. Farmers have planted crops right up to the banks, which continue to erode for lack of riparian barriers. About a mile south of Angling Road, the tree cover increases until both banks are deeply forested where the river descends into Funk Bottoms. At this point, the river reminded me of Lake Fork — only murkier. Not surprisingly, the one constant for Muddy Fork is mud. The water is brown and the banks are caked with muddy topsoil, much of it washed downstream from farms. Logjam just upstream from the confluence. I was surprised to find that some of the streambed is sand and gravel. This made landing and dragging through low spots and over downed trees more bearable. However, as I progressed downstream, the gravel and sand bottom gave way to deeper and deeper mud and a totally new phenomenon to my experience — “mudbars.” These gooey mounds of muck emerge from the middle of the stream like gigantic beached slugs. If you paddle too close to one, the submerged muck around it grabs your hull and is reluctant to let go. Fortunately, the river widens and deepens as it gets closer to the Jerome Fork confluence. This meant less wading through the muck. Except for the mud, it was a pleasant paddle. The banks along the deforested section were blanketed in wildflowers and the air was filled with butterflies, dragonflies, damselflies and an occasional deerfly. The mosquitoes weren’t bad as long as I kept moving. There was no shortage of blue heron, belted kingfishers, red-tailed hawks and assorted shorebirds and songbirds. Along the banks I encountered several well-fed squirrels and a huge groundhog scurrying down from a tree overhanging the river. On the banks, I saw the handiwork of beavers and might have come close to one. While my attention was diverted upstream, I heard the distinct sound of a tail slapping the water about 10 feet downstream of my canoe. I looked around to see concentric ripples spreading across the surface of the water from a spot near the bank. I waited to see if whatever had caused the commotion reemerged, but it didn’t. 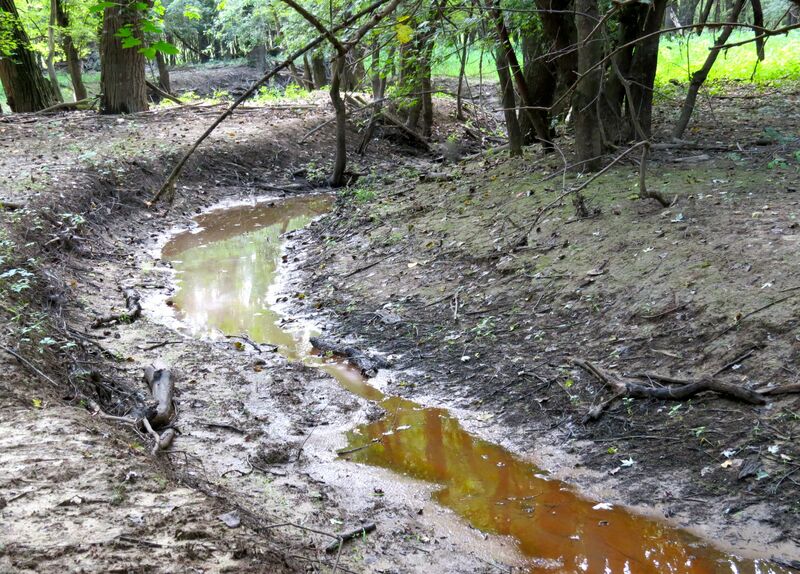 A segment of the old channel at Funk Bottoms. As Muddy Fork descends into Funk Bottoms and the forest, the sound of cars and trucks on U.S. 30 fades entirely and it’s surprisingly peaceful. The tree canopy covers the river in places, creating a feeling of intimacy found on the more pristine stretches of the Mohican River. After paddling past the second of two Funk Road bridges, it occurred to me how lucky I’d been not to have encountered one logjam. This was due to efforts five years earlier to remove logjams and leaning trees along the banks in Ashland and Wayne counties. My luck ran out about a quarter-mile short of the confluence. I came upon a three-part logjam that was spread out over a tenth of a mile. I portaged around it then paddled another tenth of a mile to the confluence and the beginning of Lake Fork. I dragged my muddy canoe out of the river, struggling to brace my foot in the slippery muck. There was a feeling of accomplishment — having canoed a fork of the Mohican River that I’d never paddled. It was also the last exploratory canoe trip in preparation for this series of articles on the forks and less-traveled parts of the Mohican. It’s been a three-month journey of discovery. I’ve learned a lot about the Mohican River in the 34 years I canoed it and camped along its banks. However, doing the research and field work for these articles made me realize there’s so much more to learn. Not that I’m infallible. My own assumption that Black Fork originated near Shelby was incorrect. Actually, it starts west of Mansfield, near the origins of Clear Fork and Rocky Fork. In further reading on the point of origin for Clear Fork, I found references to it starting in Morrow County. I suspect that this refers to other tributaries of the Clear Fork Watershed. I’ll have to look into it further to make sure. In scouting and paddling Clear Fork, I discovered Cedar Fork. I’m embarrassed to admit that there was a fork of the Mohican River I’d never heard of. I don’t know whether it would warrant another chapter in “The Other Mohican,” but I will take a second look at it. 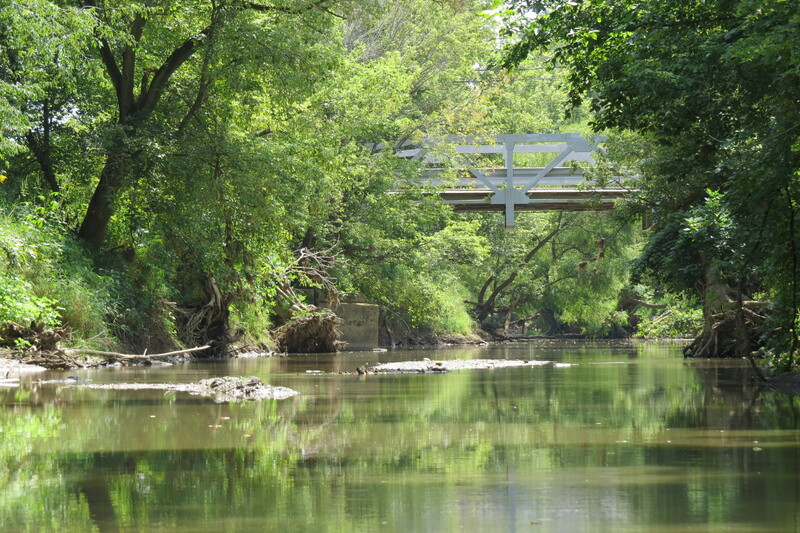 I’ve always been fascinated with the history of the Mohican River and the towns and people along its banks, so I tried to include a little of that with each article. I’ve picked up bits and pieces of river lore over the years, much of it by word of mouth. Naturally, historical accounts — oral or written — aren’t always reliable. Like many of my own river stories, they tend to grow more colorful with each telling. However, I tried to document as much of the history as I could while conducting research for this series. “The Other Mohican” won’t end with this article. I’m sure it will be reprinted or reposted online. Over time, I hope to add more snippets of history and tweak the articles here and there. Ultimately, I plan to compile these articles into a book. If so, please buy the book and don’t wait for the movie to come out. I need the money to fund future canoe trips — and gather material for a sequel.